Beer leads wine as preferred drink in U.S.
PRINCETON, N.J. -- Upper-income and highly educated Americans are more likely than other Americans to say they drink alcohol. Whereas eight in 10 adults in these socio-economic status groups say they drink, only about half of lower-income Americans and those with a high school diploma or less say they drink. The results are based on Gallup's annual Consumption Habits poll, conducted July 8-12. 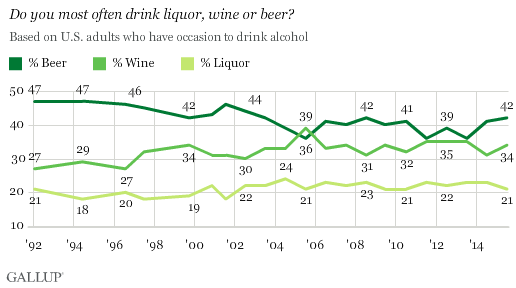 Overall, 64% of Americans say they drink alcohol, consistent with Gallup's historical trend. 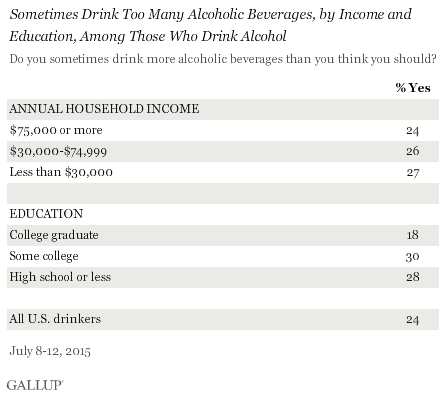 Gallup has consistently found large differences in alcohol consumption among education and income subgroups over time. The income and education differences in drinking are typically larger than those seen by gender, age, race, region and religion. Americans of higher socio-economic status certainly have greater economic resources, and can likely afford to buy alcohol when they want to drink. But they also are more likely to participate in activities that may involve drinking such as dining out at restaurants, going on vacation or socializing with coworkers (given the higher drinking rates among working compared with nonworking Americans). The direct connection between drinking and engaging in these activities is not clear from the data, but such a connection could help explain why upper-income Americans are more likely to drink alcohol than other Americans. While not as powerful a predictor as income and education, religiosity is also strongly related to alcohol consumption. Specifically, 47% of those in the current poll who attend church weekly say they drink alcohol, compared with 69% who attend church less often than that, if at all. There are also notable differences in drinking by gender, with men (69%) more likely to report drinking alcohol than women (59%). Racial differences are also apparent in that non-Hispanic whites (69%) are significantly more likely to say they drink alcohol than nonwhites (52%). Among age groups, drinking is most common among 30- to 49-year-olds. Detailed percentages by subgroup appear at the bottom of the article. Not only does the likelihood of whether one drinks alcohol vary by income and education, but so too do drinkers' drinking behaviors and preferences. For example, nearly half of higher-income and more educated drinkers say they have had a drink within the last 24 hours, compared with one-third or less of non-college graduates and middle- or lower-income drinkers. The differences are especially stark by income, as 47% of upper-income drinkers have imbibed in the last 24 hours, compared with 18% of lower-income drinkers. While higher socio-economic status drinkers are more likely to say they have had an alcoholic drink more recently, they are not more likely than others to report overindulging in alcohol. There are no meaningful differences by income level in the percentage who say they sometimes drink more alcoholic beverages than they should. But, college graduates are significantly less likely than non-college graduates to say they sometimes overdrink. It is unclear if the education differences on overdrinking truly reflect actual behavior, or perhaps reflect that those with more formal education may be less willing to report a socially undesirable behavior in a public opinion survey. Data from various government and academic studies confirm the relationship between income and alcohol consumption. The studies also indicate upper-income drinkers mostly drink in moderation, but lower-income Americans tend to abstain completely, or to drink heavily. Beer has historically been the alcoholic beverage of choice among U.S. drinkers, and it remains so this year with 42% saying they most often drink beer, compared with 34% for wine and 21% for liquor. But beer is not the leading alcoholic beverage among higher socio-economic status drinkers. 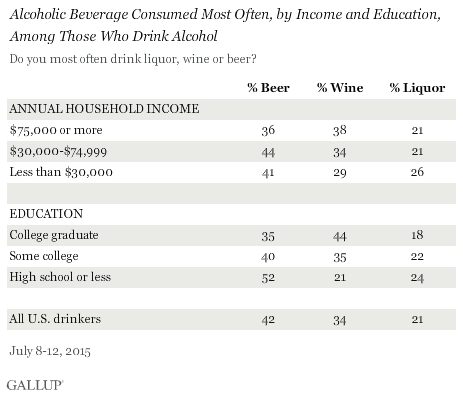 Upper-income drinkers are divided in their preference, with 38% preferring wine and 36% beer. Lower- and middle-income drinkers are more likely to prefer beer than wine. College graduates who drink alcohol show a clearer preference for wine vs. beer, 44% to 35%, respectively. 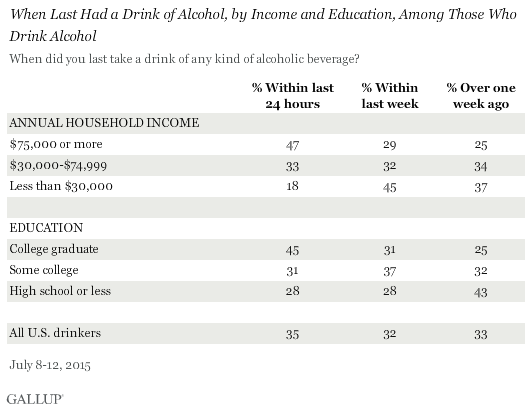 Among non-college graduates -- particularly those with a high school education or less -- beer is the preferred drink. There are other well-documented demographic differences in a person's favorite alcoholic beverage of choice, with men and younger drinkers clearly preferring beer, while women and older drinkers tilt strongly toward wine. 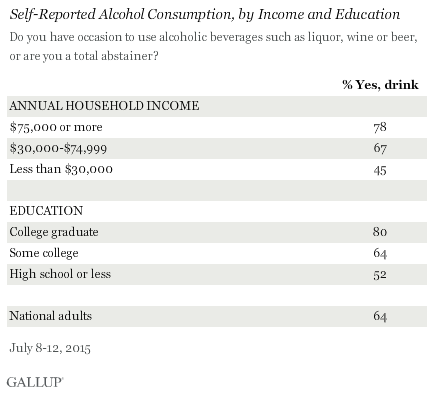 Most Americans say they drink alcohol on occasion, but drinking is far more common among upper-income Americans and those with a more formal education. Not only are higher socio-economic status Americans more likely to drink alcohol, but those who drink do so more often than lower socio-economic status Americans. These differences may reflect that upper-income Americans can better afford to purchase alcohol, but upper-income and well-educated Americans are more likely than other Americans to engage in activities in which people commonly drink, such as dining out. Also, because drinking is more common among higher socio-economic Americans, who presumably are more likely to interact socially with those of similar status, social norms toward drinking may differ among Americans with higher vs. lower socio-economic statuses. Results for this Gallup poll are based on telephone interviews conducted July 8-12, 2015, with a random sample of 1,009 adults, aged 18 and older, living in all 50 U.S. states and the District of Columbia. For results based on the total sample of national adults, the margin of sampling error is ±4 percentage points at the 95% confidence level. For results based on the total sample of 664 drinkers, the margin of sampling error is ±4 percentage points at the 95% confidence level. As some states have legalized marijuana, 47% of Americans say legalization will make driving in those states less safe. Half of Americans say it won't make much of a difference. Americans are much more likely now than they were 30 years ago to say drinking has been a cause of trouble in their family. Those who acknowledge having alcohol-related family problems are less likely to say they drink.